The entertainment in the next part of my Saturday was provided by much better basketball skills. 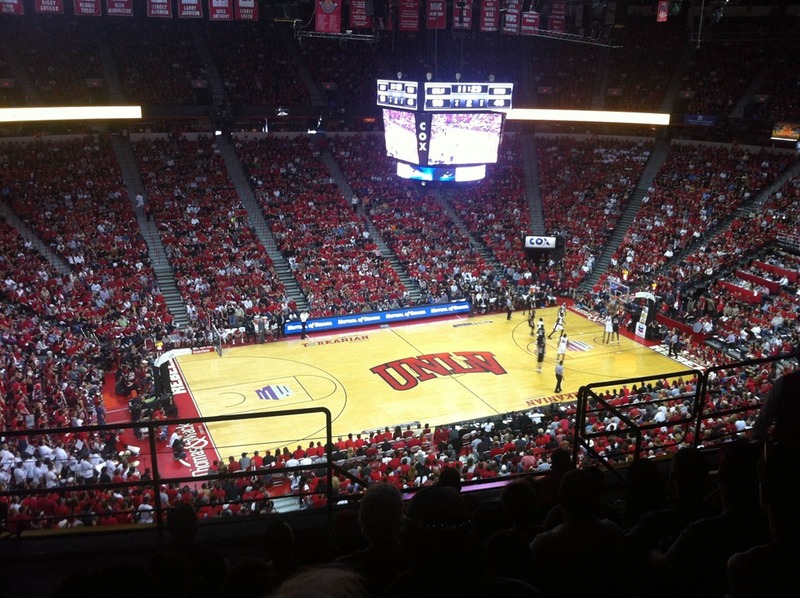 Colby and I attended the UNLV vs SDSU basketball game. Thanks, Agata, for the student ticket! I am not usually a fan of watching basketball. Colby typically has to bribe me with the promise of a jog together or an order of delicious chicken fingers at the game to get me to go. Yesterday he won me over with a brand new UNLV t-shirt. Diet wise, I’m a little torn about the idea of being allowed a “cheat meal” each week. I get that it might be a good idea for most people as a metabolism boost or to safeguard against feeling deprived, but for me, a cheat meal usually turns into a whole cheat DAY (or cheat week). As far as splurges go, however, this was well worth it. The chicken strips were fresh and tender, never frozen, with a light marinade and breading. Only 127 calories per strip. 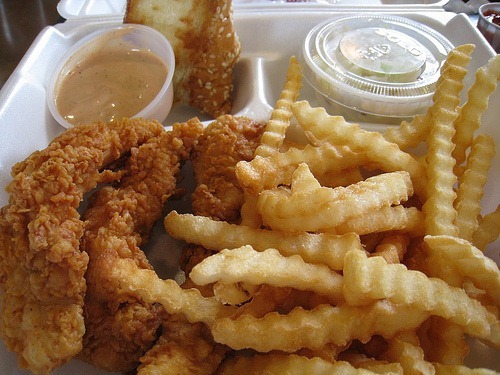 The crinkle fries ROCKED with the special Cane’s sauce. The toast is usually delicious too, but the meal we got yesterday was kids meal sized: two tenders, fries, and sauce with a cup of water on the side. I try to keep in mind that it’s ok to get fast food as long as I downsize, not supersize. Have you ever noticed that fast food, chocolate, and treats taste SO much better after a week of clean eating? I think that’s why Cane’s was so mouth wateringly exceptional yesterday. I ate very healthily most of the week. Every Sunday I do my grocery shopping, usually at Fresh & Easy because they send me good coupons and their produce is frequently marked down for quick sale. When planning my meals for the week, I always start with the clearance section so I have some extra money left in the budget for items I can’t go without, like spinach and eggs. 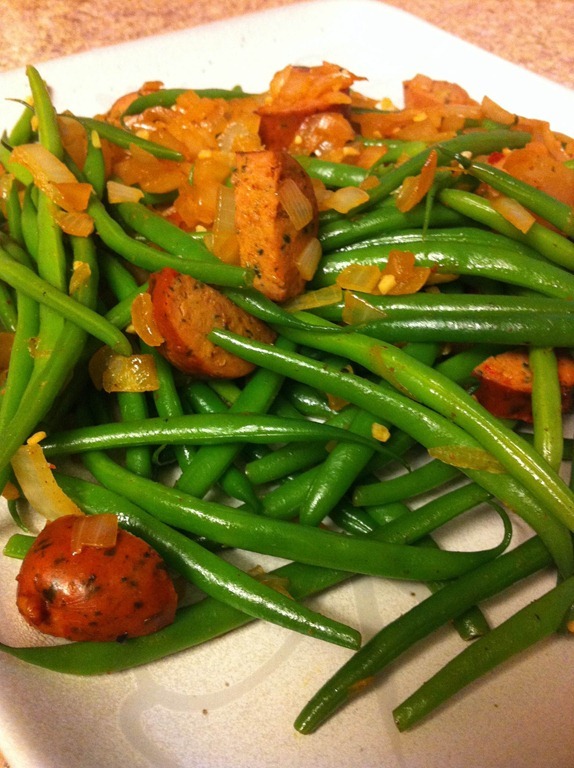 Steamed green beans sautéed with onions, hot sauce, and chicken sausage. Crunchy and spicy! Brussels sprouts tossed in olive oil, salt, and black pepper then oven roasted for 30 minutes at 425. Served with baked tilapia. Meh. They weren’t so spectacular, but maybe you’d love ‘em if you’re a big brussels sprouts fan. 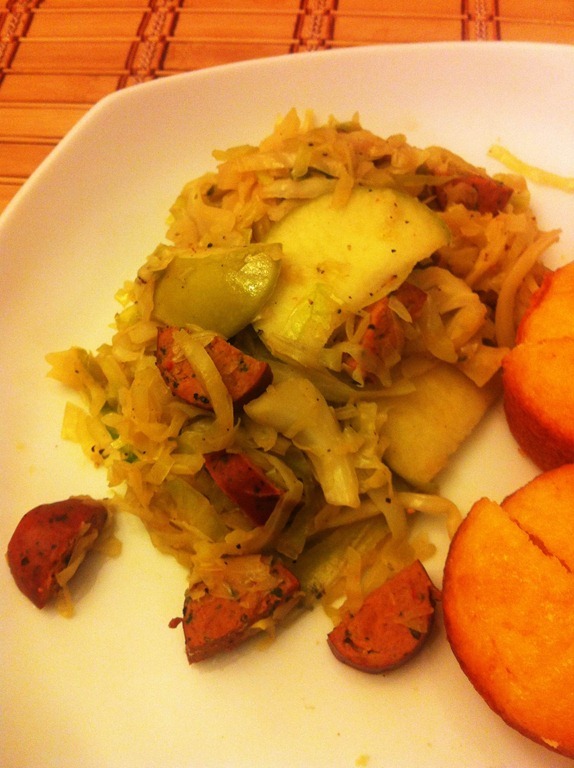 Green cabbage stewed with diced chicken sausage and granny smith apples. 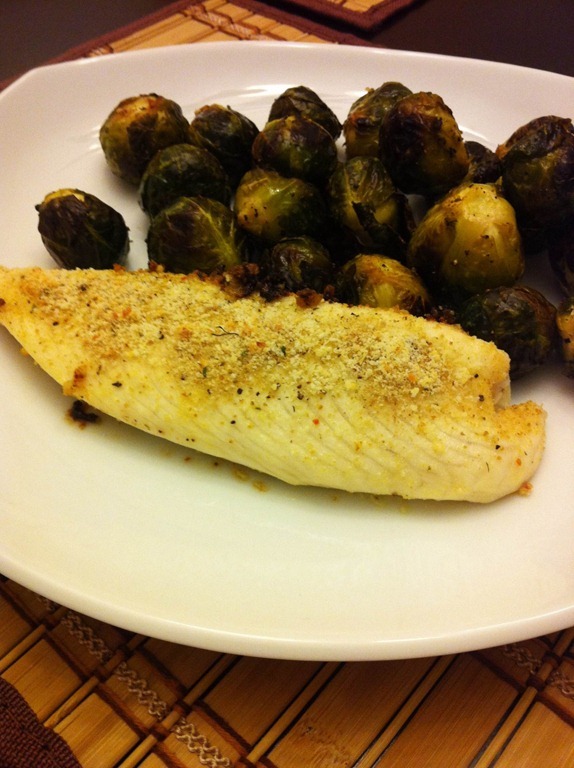 Seasoned with only black pepper and lemon juice, this dish was excellent! Colby said this was one of the best meals I’ve made so far. Definitely making this again soon! 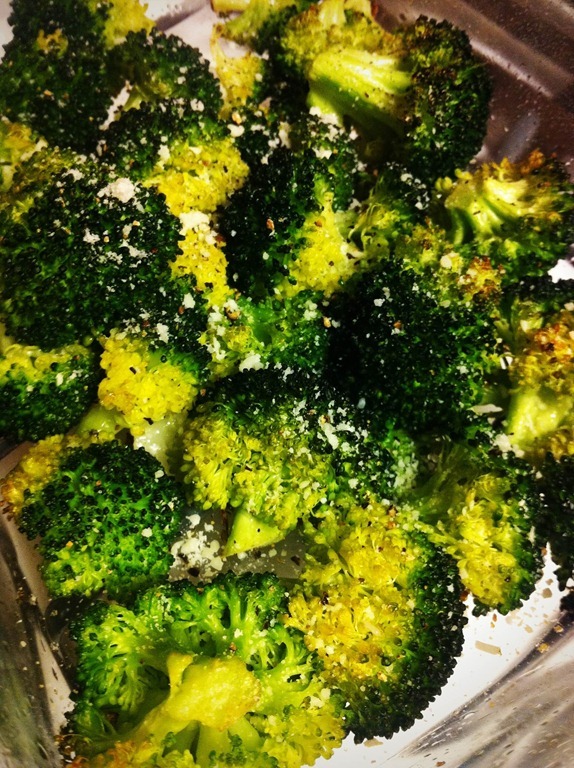 Broccoli florets tossed in olive oil, black pepper, and salt. Roasted for 15 minutes at 400 degrees and sprinkled with a bit of grated parmesan. These were freakishly good! The florets started to caramelize, so they were a little bit sweet and savory. Too bad there were none left for Colby. The radishes were the biggest challenge. How the heck do you COOK radishes? I decided to try them sautéed with a bit of butter and served with seared tilapia. You wouldn’t even know these were radishes! They were sweet and tender, a bit like potatoes but much less starchy. I ended up sautéing them for about 15 minutes in a saucepan with the lid on to steam them tender. 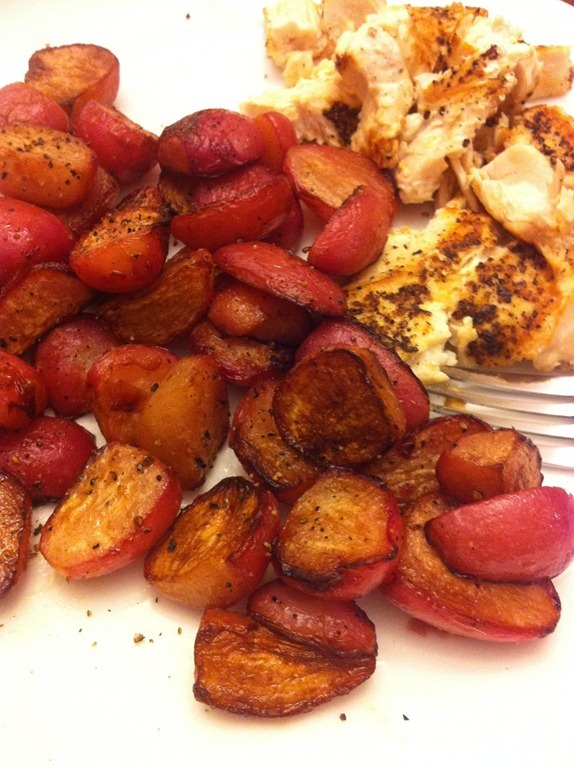 Topped simply with black pepper, these were a surprisingly good side dish. One of the highlights of my week was the unique opportunity to lead two grocery shopping tours for families of the kids I work with. The store manager at Food 4 Less provided all the kids with goodie bags filled with fresh fruit. I think the key to getting kiddos to try new fruits and vegetables is to sample them like this. Who doesn’t love free food, after all? It was great to see how excited the families were to learn about healthy grocery shopping! They eagerly examined nutrition labels and ingredients lists to pick the healthiest breads, lunchmeats, and yogurts. Can’t wait to do more tours in the near future! Do you shop with a grocery list? Do you love cooking and grocery shopping as much as I do?